The Global Volcanism Program has no activity reports for Fort Selkirk. The Global Volcanism Program has no Weekly Reports available for Fort Selkirk. The Global Volcanism Program has no Bulletin Reports available for Fort Selkirk. The Fort Selkirk volcanic field near the junction of the Yukon and Pelly rivers in central Yukon is the northernmost Holocene volcanic field in Canada. It consists of a sequence of valley filling alkaline olivine basalt and basanitic lava flows succeeded by construction of three nephelinitic pyroclastic cones and lava flow aprons. The Ne Ch'e Ddhawa pyroclastic cone (Wootten's Cone) is composed primarily of hyaloclastite tuffs, breccias, and pillow breccias erupted subglacially during the late Pleistocene (Jackson, 1989). The youngest cone, Volcano Mountain, produced young nephelinitic lava flows that remain unvegetated and appear to be only a few hundred years old. However, dating of sediments in a lake impounded by the lava flows indicated that the youngest flows could not be younger than mid-Holocene and could be early Holocene or older (Jackson and Stevens, 1992). Bostock H S, 1936. Carmacks District, Yukon. Geol Surv Can Mem, 189: 1-67. Francis D, Ludden J, 1990. The mantle source for olivine nephelinite, basanite, and alkaline olivine basalt at Fort Selkirk, Yukon, Canada. J Petr, 31: 371-400. Jackson L E, 1989. Pleistocene subglacial volcanism near Fort Selkirk, Yukon Territory. Geol Surv Can Pap, 89-1E: 251-256. Jackson L E, Stevens W, 1992. A recent eruptive history of Volcano Mountain, Yukon Territory. Geol Surv Can Pap, 92-1A: 33-39. The Global Volcanism Program is not aware of any Holocene eruptions from Fort Selkirk. If this volcano has had large eruptions (VEI >= 4) prior to 10,000 years ago, information might be found on the Fort Selkirk page in the LaMEVE (Large Magnitude Explosive Volcanic Eruptions) database, a part of the Volcano Global Risk Identification and Analysis Project (VOGRIPA). There is no Deformation History data available for Fort Selkirk. There is no Emissions History data available for Fort Selkirk. 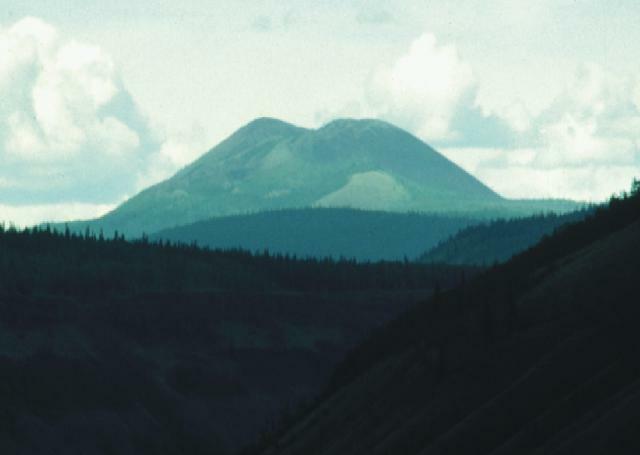 Volcano Mountain, shown above, is a pyroclastic cone of the Fort Selkirk volcanic field in the central Yukon Territory and is Canada's northernmost Holocene volcano. Volcano Mountain comprises a cinder cone and a series of lava flows that traveled to the NE and SW. The Fort Selkirk volcanic field is located near the junction of the Yukon and Pelly rivers in central Yukon. Photo by Lionel Jackson (Geological Survey of Canada). There are no samples for Fort Selkirk in the Smithsonian's NMNH Department of Mineral Sciences Rock and Ore collection. Large Eruptions of Fort Selkirk Information about large Quaternary eruptions (VEI >= 4) is cataloged in the Large Magnitude Explosive Volcanic Eruptions (LaMEVE) database of the Volcano Global Risk Identification and Analysis Project (VOGRIPA).